It's Thursday and that means the week is on it's way to being over! I'm so excited for the weekend, for time to put my house in order, spend time with husband and relax. I need a weekend of nothingness after the busy weekends we've been having in the Hill household. Throwing a daily workout regimen into our weekdays (and Saturday) has proven to take up quite a large chunk of time. All in the name of being fit, right?! Additionally, eating healthy, fulfilling dinners is a time-sucker when it takes ample time to prepare (we need more hours in the day!). So we're always looking for quick and healthy meals to make sure our evenings aren't gone after we eat dinner. 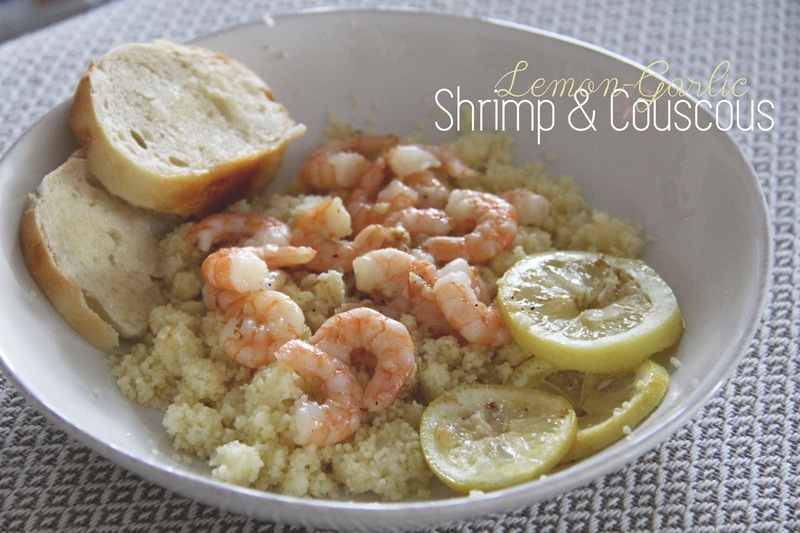 One meal that husband and I love is lemon-garlic shrimp and couscous. It's healthy, delicious, and super easy to make, taking up little to no time. Give it a whirl and tell me what you think! Preheat the oven to 400°. Combine the olive oil and lemon zest in an 8x8 glass baking dish, making sure the olive oil at least covers the entire bottom of the dish. Drizzle more if needed. Add the salt and pepper and bake for 12 minutes, checking to make sure it doesn't brown too much. Meanwhile cook the couscous, following the directions on the box. Remove the baking dish from the oven and add the butter, moving it around to help it melt. Add the shrimp and minced garlic, tossing it all around in the oil mixture and coating the shrimp well. Place lemon slices on top. Cook for 8 minutes or until the shrimp has completely cooked. 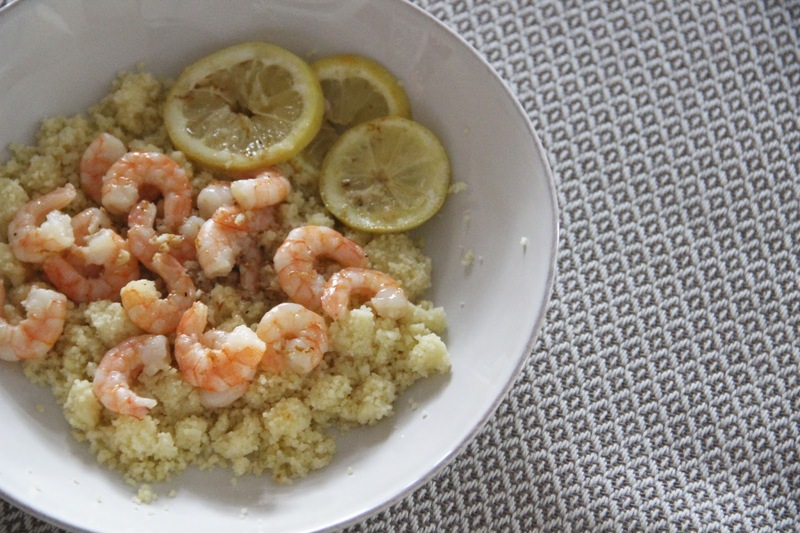 Serve over the couscous (or if you're me, beside the couscous because you don't like your food to touch). 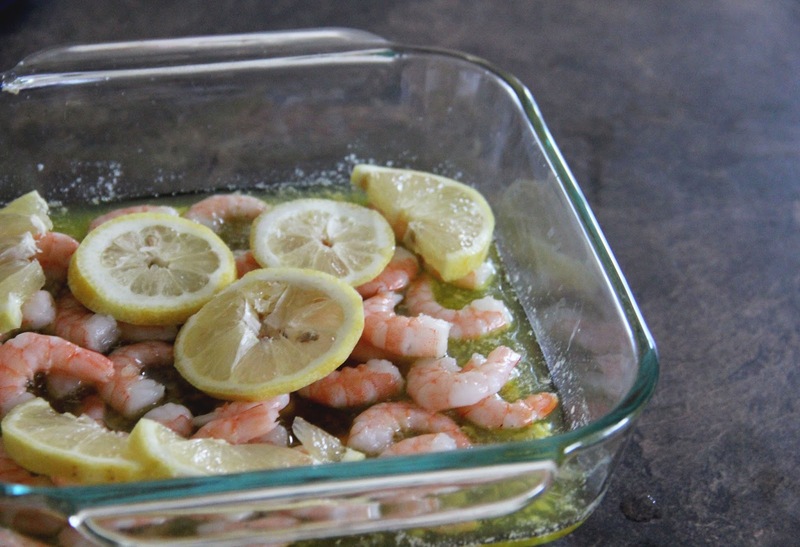 Squeeze any additional fresh lemon juice over the meal if so desired. We eat this as is, with buttery, garlic bread typically. But, since we're trying not to consume a lot of bread, I recommend some steamed veggies for a nice. And if couscous isn't your thing, you can always make whole grain pasta.